Rosa had the great good fortune of being born to an artistic (and rather eccentric) couple. Her father, Oscar-Raymond Bonheur, was an artist, art teacher and ardent supporter of independent thought in his children, while her mother was a music teacher. After her 1853 masterpiece The Horse Fair (Le Marché aux Chevaux) became world famous, two interesting things happened. Rosa began (1) receiving honors, including the Légion d’honneur (from the Empress Eugénie, in 1865), previously only held by men and (2) retreating from the limelight. 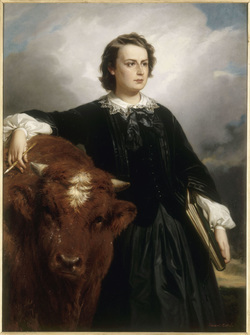 Though she is best known for being one of the most faithful animaliers (painters of animals) to ever hold a brush, Rosa also worked in sculpture, casting bronzes (of animals, of course) early in her career. Today she is also revered for being an outspoken feminist, and gaining female visual artists more equal status.